GSA extends mandate to deliver digital data, leading federal agencies in deploying newest new media. Using both technology solutions and training initiatives, the General Services Administration is assisting other federal agencies in providing easy-to-locate and clearly written information both on the Web and through other data sources. The organization’s traditional support to federal agencies includes everything from managing facilities, to developing information resources, to providing products ranging from paper clips to vehicles. Over the past few years, the General Services Administration’s (GSA’s) role has expanded to delivering digital services, which includes seeking out the newest technologies and helping other federal agencies do the same. Martha Dorris is deputy associate administrator in the GSA’s Office of Citizen Services and Innovative Technologies (OCSIT). Dorris says she thinks of her agency—which was formed in June 2002—as a hub for the delivery of information, services and data for the public. At that time, all the direct-service channels were pulled together, and OCSIT shared its experience in that process with other agencies. That type of support role has grown considerably over the last four to five years, according to Dorris. Approximately three years ago, Dorris says, the mission was refined further to give the GSA a role in improving citizens’ information-gathering experience not only on government websites, but also from other digital sources. One resource is the USA Search Affiliate Program, which was designed by GSA Web experts. The program ensures that users find the most relevant information based on their search criteria and allows search engine optimization to be managed through a simple online administrative code. Both the Defense Department and the Department of Homeland Security are set to join the program, which will place a custom search engine optimization program on their public-facing websites. The Search Affiliate Program also allows the search engine optimization to be managed through a simple online administrative console. On the training side, the GSA’s Web Manager University allows any government employee who manages Web and social media resources in federal, state, tribal, local or territory websites to take advantage of cost-effective training. Training, she says, has many elements, including Web governance. This includes creating a good team to run a website and developing policies and procedures for Web operations. Training also is offered on topics ranging from social media, to usability and user-centered design, to Web metrics, to search engine optimization. Mobile and emerging technologies also are part of Web Manager University offerings. In the past year, Campbell explains, her office also has offered a number of plain-language classes in response to the legislative mandates of the Plain Writing Act. The act specifies that everything from executive branch orders, to complicated industry regulations, to informational content on agency websites, be written in straightforward English, rather than complicated bureaucratic language. The law, Campbell says, also mandates that agencies provide training to employees who are responsible for creating or publishing such content. As a result, the Web Manager University combined writing for the Web classes with the new plain-writing classes. The organization sponsors as many as 50 training and networking events each year, as well as an annual two-day conference where government Web managers hear from the best government Web practitioners. Participants also gain industry insights from top officials at Web and social networking companies. Last year’s conference drew approximately 500 Web managers from across the nation. The 2012 conference will be held in May in Washington, D.C. Web Manager University also is the hub of a significant and lively community of Web experts who regularly exchange best practices. Dorris recalls that during the unprecedented weeklong federal government shutdown from a blizzard in the Washington, D.C., area in 2010, the Web manager group collaborated to use its websites and the GSA-owned portal, USA.gov, to inform citizens about which federal offices were closed and which were still operating. Campbell’s group also manages challenges and prize competitions by more than 36 agencies through Challenge.gov. This one-year-old Web portal offers monetary rewards and other peer recognition to individuals or organizations that provide innovative solutions to agency problems. In the past year, more than 120 such challenges have been posted by the participating agencies. In one case, Campbell says, the U.S. Air Force Research Institute posted a $20,000 prize challenge to determine how to drop humanitarian food and water safely into highly populated areas without injuring civilians on the ground. She says the challenge drew 1,100 competitors from 75 countries. The 168 proposed solutions were narrowed down to two finalists, which are being evaluated by the Air Force as potential, realistic operational solutions to deliver humanitarian relief. 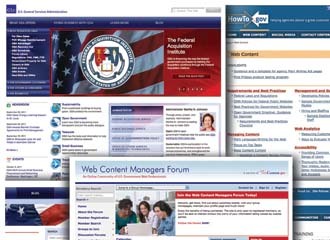 One of the newest Web Manager University initiatives is First Friday, which is a once-a-month effort to have selected federal agencies test the usability of their websites with randomly selected groups of actual users. In one case, Campbell explains, a First Friday session helped uncover significant usability problems with the State Department’s passport application website. The GSA also has launched HowTo.gov, a portal containing many of the best practices of website and digital resource management compiled over the last several years by Web Manager University participants. By the end of this year, Web Manager University is expected to have a new, yet-to-be-determined brand, Campbell reports. Next year, the university will be reaching out beyond its current audience consisting primarily of agency Web and social media managers to agency chief information officers, federal information technology professionals and agency program managers. Campbell explains that in many agencies, most mission-related content posted on agency websites originates in program offices, and she believes that Web Manager University can provide a service to program managers by helping them understand how to leverage the power of the Web to achieve agency goals. Federal agencies also are trying to determine how to integrate the newest generation of mobile devices, including popular smartphones and tablet computers, into their Web strategies. One website, http://apps.usa.gov, helps address that problem by spotlighting more than 80 mobile, cross-platform applications developed by federal agencies. Among the apps is the Transportation Security Administration’s (TSA’s) My TSA app, which not only lets mobile users know what they cannot bring on an airplane, but also provides up-to-the-minute status updates on flights. Gwynne Kostin, OCSIT’s director of mobile, is responsible for this website. Kostin explains that the GSA has developed an app for BlackBerry and iPhone smartphones, which helps federal workers calculate and track per diem for business-related travel, including lodging, meals and expenses. She emphasizes that this app is so popular that the GSA is developing a version for Android smartphones. Even the GSA’s mission of providing consumer information to citizens by more traditional means is evolving with new technologies. Bev Godwin is director of OSCIT’s Federal Citizen Information Center (FCIC) and former director of USA.gov. Several years ago, Godwin also was responsible for negotiating the first blanket user agreements through the GSA that allowed federal agencies and their staffs to officially use more than a dozen popular social media sites, including Facebook and Twitter. During the decades of the 1960s through the 1980s, the GSA’s Consumer Information Center put the small town of Pueblo, Colorado, on the map as the distribution center site for a wide variety of government documents containing useful consumer information. Godwin says that while that role continues today, the means to distributing that information has changed somewhat. In September, Godwin notes, the GSA launched Publications.USA.gov. She explains that this website blends the best of the old with the new. All the print publications available in hard copy, as well as those publications from around the government that are only available digitally, can be downloaded. They also are being converting to e-book format. The latter insures readability on popular electronic readers such as Barnes & Noble’s Nook, the Apple iPad and the Sony Reader. Orders for hard copies will be processed through the Government Printing Office and the FCIC’s facility in Pueblo. In addition, Godwin’s office is coordinating a new video challenge to citizens: to create short, informational videos on the steps needed to do things such as apply for a federal grant and change an address for those who regularly deal with multiple government agencies. Godwin says that for government, the key to keeping up with the changing technology is keeping up with how citizens are consuming information.